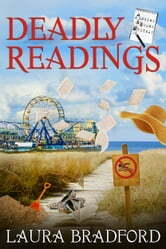 The first book in Laura Bradford’s debut Jenkins & Burns mystery series! The Jersey Shore has always been known for warm sand, lively boardwalks, and the promise of carefree summer days. This season the small scenic town of Ocean Point, New Jersey, is not nearly as carefree as tourists would hope. 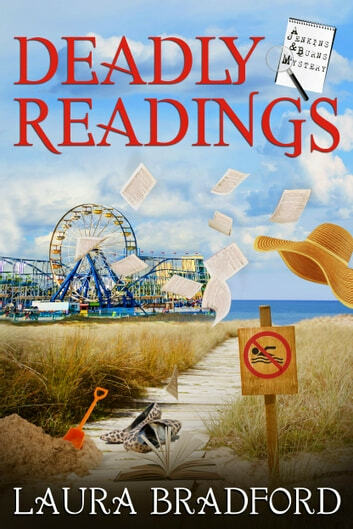 The discovery of the body of a young woman is the first in a string of seemingly random and senseless murders, murders connected only by a warning from the same boardwalk fortune-teller. It’s a crisis that puts local detective Mitch Burns on edge, and his job in jeopardy. It’s up to him to solve the crimes and protect the livelihood of the town, a livelihood that relies almost entirely on tourists. With the help of newly hired local reporter Elise Jenkins, the two step out to discover who the killer is, before another body is found. This book was originally published under the title Jury of One. Laura Bradford is the bestselling author of the Jenkins & Burns Mysteries, the Amish Mysteries, and the Southern Sewing Circle Mysteries. She is also an award-winning romance author for Harlequin American. Kayla’s Daddy—her first romance—was nominated for RT Magazine’s Reviewer’s Choice Award for Best Harlequin American and has gone on to be translated in both Spain and Germany. Her third romance, Miracle Baby, won that same award in 2010. A graduate of Xavier University in Cincinnati, Ohio, Laura lives in New York with her family. For more information and all the latest book news, visit her website at www.laurabradford.com. You certainly will not regret reading this book,,, easy reading, and well put together !